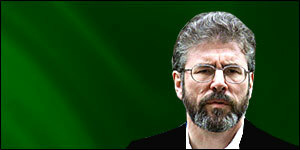 For 18 years Gerry Adams has been the undisputed leader of the republican movement through war and the peace process. He has not faced a single serious challenge to the direction in which he has taken Sinn Fein and the IRA. This is despite the fact that several sacred cows of republicanism have been publicly slaughtered on the way. The Sinn Fein president has, of course, been a pivotal figure for almost 30 years. In 1972, at the tender age of 24, he was already considered important enough to be released from jail to join the IRA delegation that met the British government in London. But to this day - and it is one of the more unfathomable aspects of the man - he denies ever being in the IRA, even though it would have been impossible for him to have risen to the position he now holds if that were not the case. Security force assessments contend he has held a number of senior positions within the IRA, including membership of its ruling army council, but Mr Adams has never wavered in his denials. He has been the key strategist in moving republicans from Armalite to ballot box, telling them as early as 1979 that victory could not be achieved solely by military means. A year later he went further. If the British now realised they could not have a military victory, he argued, so should republicans. At that point the Armalite had the priority, not the ballot box, but the hunger strikes of the early 1980s brought electoral gains which began to twist the focus. The single track of armed struggle became a twin track of violence and politics. His election as MP in West Belfast and his elevation to Sinn Fein president, in a coup by northern republicans, made 1983 a pivotal year. The new party leader was now in a position to guide what he calls "the republican project" in the direction he thought it should go. The electoral gains made by Sinn Fein frightened London and Dublin who saw dark days ahead for the main nationalist party, John Hume's SDLP. The Anglo-Irish Agreement of 1985 was seen as an attempt to secure the SDLP's position and freeze out the extremes, but in 1988 Gerry Adams and John Hume were holding private talks. Mr Hume became convinced republicans were serious about finding a political way forward and although the 1988 discussions ended amid recrimination, they began again soon afterwards and became public in 1993. The "Hume-Adams process" eventually delivered the 1994 IRA ceasefire which ultimately provided the relatively peaceful backdrop against which the Good Friday Agreement was brokered. All along the way, Mr Adams nudged Sinn Fein further down the political path. The first sacred cow to go was the policy of refusing to take seats in the Irish Parliament, a move which led to a split in the movement in 1986. Gerry Adams: "Dealing with him is like peeling an onion"
Even more important was the vote on whether the party should take its seats in the Northern Ireland Assembly in the aftermath of the Good Friday Agreement in 1998. The Sinn Fein president delivered more than 90% of a special ard fheis or party conference on that one, a remarkable piece of political management given the "no return to Stormont" slogan in the 1997 general election campaign. There has been internal dissent among republicans throughout the peace process but there has not been a critical split. That again is testament to Mr Adams' party management. Adams the man remains an enigma. His political opponents say dealing with him is like peeling an onion - there is always another layer just when you think he has got to the heart of the issue. They say he carefully makes his bottom line a moving target as long as he can. Consider the decommissioning saga which has been running now for seven years without a single weapon being placed "beyond use." That has led more than one to express the opinion that while they are certain he is serious, they sometimes wonder what it is he is serious about! Within his own community he is generally revered as a clever politician who has largely replaced the muscular approach of physical force republicanism with a mental toughness which has delivered more than bombs and bullets ever did. Who might have bugged Gerry Adams?